The basic presupposition underlying this book is the unity of human knowledge in its very wide sense. Different forms of knowledge and their present-day specializations should not make us blind to their thematic and conceptual overlap. Disciplines like religion, ethics and law have their unmistakable affinity defined in terms of dos and don'ts. Philosophy, science and cosmology cannot be sharply demarcated because of their historically shifting boundaries. History, sociology and anthropology, in view of their ineliminable human roots, are bound to remain mutually interactive forever. History has no intrinsic metric or period of its own. It is for pressing practical reasons that disciplines of knowledge have always been undergoing change in very many ways, partly theoretical and mainly practical. Cultural space, unlike political state, knows no boundary. This is evident from the fact that we find many religions, various ethnic groups and diverse social structures and practices within the bounds of a single state. With the development and dominance of science, particularly communication systems, all forms of knowledge have been becoming increasingly sharable by peoples living in widely dispersed geographical areas, living under different political systems and speaking different languages and dialects. A many-sided attempt has been made in this book to indicate that affinity between cultural systems, convergence of political structures and similarity between art forms are all due to continuous interaction and intermixture between the human groups living on the globe. Through the windows and doors of different forms of religion, philosophy and science we can perceive a growingly clear global view of the mankind as a whole. Relying on the findings of diverse disciplines, literary, religious, philosophical and scientific, D.P. 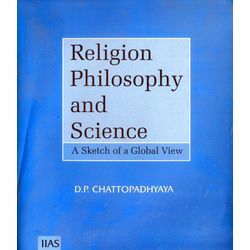 Chattopadhyaya has offered a sketch of a veritable global view. Rarely has an interdisciplinary thinker and writer ever tried to present the essences of so many disciplines within such a limited scope. To the reader it will be clear that the author of this book has been guided, besides the published books and the available oral traditions, by his own reflections on and insights in to the same. The basic presupposition underlying this book is the unity of human knowledge in its very wide sense. Different forms of knowledge and their present-day specializations should not make us blind to their thematic and conceptual overlap. Disciplines like religion, ethics and law have their unmistakable affinity defined in terms of dos and don'ts. Philosophy, science and cosmology cannot be sharply demarcated because of their historically shifting boundaries. History, sociology and anthropology, in view of their ineliminable human roots, are bound to remain mutually interactive forever. History has no intrinsic metric or period of its own. It is for pressing practical reasons that disciplines of knowledge have always been undergoing change in very many ways, partly theoretical and mainly practical. Cultural space, unlike political state, knows no boundary. This is evident from the fact that we find many religions, various ethnic groups and diverse social structures and practices within the bounds of a single state. With the development and dominance of science, particularly communication systems, all forms of knowledge have been becoming increasingly sharable by peoples living in widely dispersed geographical areas, living under different political systems and speaking different languages and dialects. A many-sided attempt has been made in this book to indicate that affinity between cultural systems, convergence of political structures and similarity between art forms are all due to continuous interaction and intermixture between the human groups living on the globe. Through the windows and doors of different forms of religion, philosophy and science we can perceive a growingly clear global view of the mankind as a whole. Relying on the findings of diverse disciplines, literary, religious, philosophical and scientific, D.P. Chattopadhyaya has offered a sketch of a veritable global view. Rarely has an interdisciplinary thinker and writer ever tried to present the essences of so many disciplines within such a limited scope. To the reader it will be clear that the author of this book has been guided, besides the published books and the available oral traditions, by his own reflections on and insights in to the same.